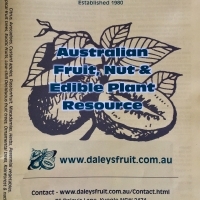 Daleys Fruit Tree has Plants for Sale to Swanhaven and can Mail Order them to you door. Click to Find out how much Freight Will Cost. This is a groundcover plant that produces small, white, knobbly tubers in winter after the foliage dies down. 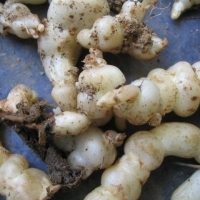 The tubers have a delicate flavour, being slightly sweet and nutty, they add crunch to salads and stir-fries and are popular as a novelty vegetable. Can be eaten raw or cooked. Water well in summer. Can spread if given good conditions but are easily controlled by fencing them off and letting the chooks in for a day or two. Even tiny bits grow into full sized plants.